How can I back out a merge in Mercurial and later remerge with that branch? I have two branches, default and branch1. By mistake one person in our team merged branch1 with default. The content in branch1 is not yet ready to merge with default (it contains a major rework of the build & deploy environment). We did an experiment with 'hg backout', backing out the merge (not sure this is the right way to do it). Then the changes from branch1 gets deleted on default, which is fine - but we can not remerge with branch1. How should we solve this issue? There are many scenarios here where you might want to do this, I'll make each scenario a headline, so that you can find the scenario that fits your case. Note that I'm still learning Mercurial, and I'd like pointers if something I say is wrong, using the wrong terminology, could be done better, etc. In this case, simply discard the local clone, and get a fresh clone from a safe repository. Try to use the REBASE extension, this will move the changesets from one location to another. If the changesets are based on code-changes that were introduced with the merge, some manual work must be done to reconcile the differences. Try to use the TRANSPLANT extension to "copy" the changes from one location to another. Still, same problem exists as with the first two. Do the work again, probably with the help of a diffing tool to take changes done in the changesets I want to discard, and re-do them in the correct location. Clone and pull, and specify the hash of the changesets leading up to, but not including the merge. In essence, create a new clone by pulling from the damaged clone into a new one, and avoid pulling in the merge you don't want. hg clone damaged -r <hash of first parent> . In this case, I would see if step 1 or 2 could be done, but it might have to be done in a lot of places, so this might involve a lot of work. If nobody has done work based on the merge changeset, I would use step 1 or 2 to clean up, then push to the master repository, and ask everyone to get a fresh clone from the master repository. The programmer pushed the mergeset, and you don't know who will have the merge changeset. In other words, if you succeed in eradicating it from your repositories, a stray push from someone who still has it will bring it back. Ignore the merge changeset and work in the two branches as though it never happened. This will leave a dangling head. You can then later, when you've merged the two branches, do a null-merge for this head to get rid of it. You can then do a null-merge to get rid of the dangling head. Unfortunately I don't know how to do that except through TortoiseHg. It has a checkbox where I can discard the changes from one of the branches. I use backout for merge cancel. You can not remerge, but you able to "backout backout merge", i.e. 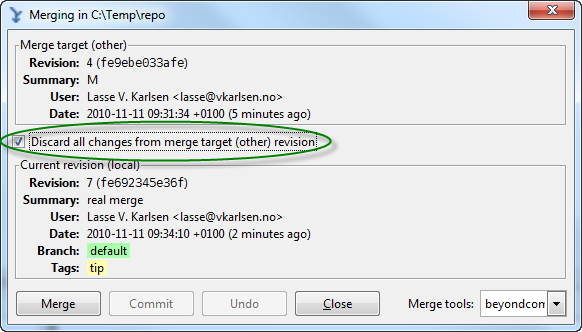 when you want remerge, you make 'hg backout' on "Backed out merge changeset ..." commit and then merge branch again. Thanks to everyone for the great input! Since we were kind of in a rush to solve the problem, and our group is relatively new to Mercurial, we used a very pragmatic solution. On our repository server we created a new repository, then we cloned the old repository up until the revision right before the merge. Then pushed the new clone to the server and sent out the new link to everyone. Luckily we are a quite small development team. You cannot really backout a merge nicely. IMO, the best way to handle this would be just to abandon the merge and continue the strand of changesets from before the merge, leaving a dangling head (which can be stripped). If other changes have happened since the merge, they can be rebased onto the new "good" head. This would result in (at least one) unresolved head, depending on what you just forgot. More depending on who just pushed from what branch. I love HG and use it avidly, but their idea of a branch can drive someone batty when coupled with a history that is (by design) intentionally immutable. I usually clone a backup (locally) of the repo prior to doing a branch merge, for just this reason. I always check before pulling. Eric Raymond is working on something that is more or less DVCS agnostic that can (hopefully) help in situations just like the oops you described, but I don't think he's going to have HG support fully implemented for another week or two. Still, it might be worth watching. But, only useful if nobody has pulled the 'ooopsie' tip. I had this exact issue. A coworker accidentally merged my branch into the default branch while it was still incomplete. Initially I just backed out that merge which seemed to work fine until I wanted to merge my branch into default for keeps. Files that I needed were being marked for deletion upon merging. The solution was to go all the way back to my original back out that fixed my coworker's mistake and back out that back out. This stopped the files from being marked as deleted and let me successfully merge my branch into default. Not the answer you're looking for? Browse other questions tagged version-control mercurial dvcs or ask your own question. How to merge to get rid of head with Mercurial command line, like I can do with TortoiseHg? Mercurial: Any way to “merge and discard changes”? Mercurial: Can I rename a branch? Why are Mercurial backouts in one branch affecting other branches?